I escorted a group to Athens/Aegean cruise in 2002. When we arrived in Athens, we stayed at a great hotel in the Plaka district where the neighborhood shops and restaurants surrounded us. My room was on the fifth floor. As I stretched out on my bed with the balcony door open and the white curtains flapping in at me, I had a full view of the Parthenon and pinched myself to make sure I wasn’t dreaming. In the summer, Athens is as dry and hot as Arizona. I remember walking around the neighborhood at three in the afternoon. The shops were closed, and I wondered why. Ah, it was the Greek siesta. By six, the shops and restaurants had reopened and stayed open until whenever. At night, the Parthenon is lit up. I never wanted to close my eyes. Every time I rolled over in the middle of the night, there she was, glowing in at me. It’s one of those moments when you realize you are on the other side of the world, and you are alive. I can close my eyes and still see the glow of the fantastic Athenian temple. One of the few regrets of my life was not grasping the opportunity to see Greek drama performed as it had 1,800 years ago at the The Odeon of Herodes Atticus. Built in 161 AD, this stone theatre is located on the south slope of the Acropolis of Athens. The amphitheater was a venue for drama and musical concerts holding 5,000 spectators. I stumbled by the entrance one evening while a concert had just begun. I had no idea what was the performance. I could have bought a ticket but decided not to because I was by myself. What a stupid reason. Eleven years later, I still kick myself for not attending. 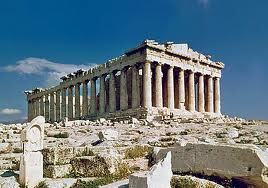 The walk around the Parthenon is only a few miles. The hookah bars, the Gyros, the pottery and linen, and the colors blue and white go with you where ever you wander–the people laugh, the music plays, and the Ouzo pours. Photographers love the light here. Day or night, I had a lot of fun people watching and strolling away the hours. Stratis Haviaras is a contemporary Greek poet, and his first novel, When The Tree Sings written in 1979 is part historical fiction, part coming-of-age story and part lyric poetry. It connects seemingly unconnected incidents into an original narrative. The narrator is a man who reflects back to when he was a boy of eleven. The boy describes the incidents of his life during the German occupation of Greece of World War II. He belongs to a mountain community; the elders who watch over him explain the mysteries of nature, of life, reminiscent of Greek myths in their poetic illusions and platitudes. The boy witnesses many horrors. He saw his father’s death. German soldiers torture mice on live electrical wire, the rodent’s screams and smoking hair taking on a symbolic connotation. He saw the bloodied body of a tortured man. He stands strong, and very adult like when soldiers toy with him and allow him to eat the roasting chestnut if he can hold it in his palm until it cools. The boy, suffering from starvation, accepts the challenge. The pain of his burning flesh cannot supersede the roar in his belly for food. However, it is the haunting story of the sparrow that is most telling of the narrator’s character. He catches a sparrow on a window sill and twists its neck and prepares to roast him. I love how it shows the maturity of the boy. I appreciate the mystical, natural circle of life between man and animal. German soldiers are obviously the predators of the Greek people. It’s absurd; the mountain people are harmless and unassuming. A war where German soldiers feel the need to oppress them is ridiculous. The Nazi game affects the lives of innocent and adds to the surrealism of the time. Because the narrator is unaware of his magical storytelling abilities, he seems fitting to follow the footsteps of his great Greek predecessors. Not much has changed since The Iliad or The Odyssey. Men still strike and engage in war. Innocents suffer and starve. The beauty of the book is Haviaras’s ability to weave a boy’s observances of nature into a communion around the horror that is manmade. It illustrates mankind’s destructiveness, but somehow, the beauty of nature manages to soften the blow of mankind’s senseless existence. I took photos from very similar angles when I visited Athens two years ago. Thanks for mentioning the book, since I have not heard about it before. Beautiful photos and the novel sounds intense. It’s beautiful despite the heavy material. Sounds and looks like a great trip to Athens, and a very moving book too. I will be adding it to my wish list today. Oh, great! It’s slim and feels like a long poem.